Saltaux fell in love with electronic music at the age of 14. His visits to the cult club Ultraschall-Airport Riem in Munich from 1994 to 1996 and the inspiration from the sets of Surgeon, Jeff Mills, Sven Väth and Bandulu resulted in a compassion for techno that is unbroken until today. From there it led to the first 1210 that decorated his home and set the milestone for his first public performance in the Coconut Bar. When he was 17 he met Joseph Seibl and Markus Schneider, the organizers of the Kraft Party Team and today..s owners of the Volksgarten. At the early age of 18 he could enthrall and inspire the audience with the sounds of his gigs in the Reactor in Munich. Unfortunately he had to pause due to his profession in 2001 for a few years. He then concentrated on his first steps towards production. From the beginning of his DJ life until now he has kept to his strongly techno influenced, somewhat very experimental style. Over this period of time Saltaux worked on his music and improved it more and more. After experimenting with the combination of many styles this resulted in the end in a mix of minimal, tech-house and progressive sound. 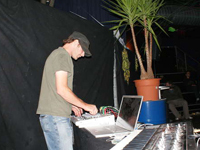 Due to his love to psychadelic sounds his spectrum was widened and he could turn to the Goa Riege in electronic music.